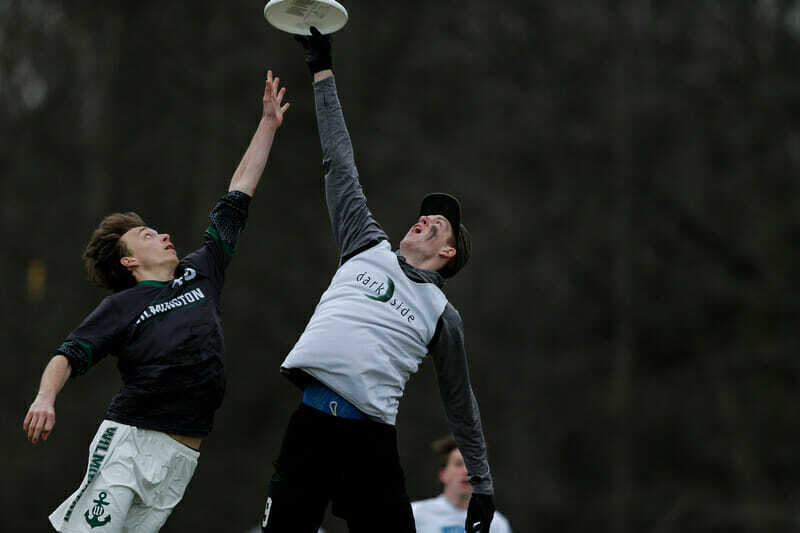 CHARLOTTE–On a chilly weekend in North Carolina, the best of the Atlantic Coast squared off with teams from all around the East Coast and Midwest in a battle for bid points and early season supremacy. While #1 UNC continued its methodical march towards a repeat, there was plenty of drama elsewhere around the tournament complex, as some surprise teams — including no. 20 seed Ohio — made a splash and some Nationals contenders clashed for the first time this season. Ultiworld Editor-in-Chief Charlie Eisenhood has staked his reputation to #1 North Carolina Darkside this year, publicly pronouncing that he believes UNC will run the table undefeated this season. So far, so good, as their tally now stands at 13-0 after winning Queen City Tune Up. Darkside gained steam over the course of the weekend, going from a near stumble in the first round of pool play to blowing Massachusetts out of the water in the final. If this is the trajectory of their season, then the rest of the division may need to duck for cover and wait ’til next year. In the first round of pool play, #25 Ohio State put a legitimate scare into Darkside, breaking late to force double game point. The pressure may have been the morning jolt UNC needed, as Darkside marched down the field through Leadbelly’s maze of handler poaches to score. 2018 POTY Matt Gouchoe-Hanas and newly minted U24 national team member Elijah Long churned up yards with handler movement and mark control before Gouchoe-Hanas eventually found a soft spot in the poach scheme, hitting Anders Juengst with an around backhand for the score and the game. The close call was a warning shot that definitely seemed to wake Carolina up. From that point on, no one even got close. They cruised to first place in Pool A, then began Sunday by stopping Alabama’s quarters run in its tracks. #23 UNC-Wilmington were able to scratch out a break on Darkside early in the semifinals before Carolina turned on the jets en route to a 15-10 win. The final against #7 Massachusetts ended at 15-8, but it could have been 15-4. UMass kept pace in the early stages of the game. Tannor Johnson’s gravity freed up space for his lookalike sophomore transfer Phil Joyce to work unders, while Jake Radack’s blades found holes over the top of the Carolina zone. Greg Oreste launched his 5’9” frame over a pile of Darkside defenders to come down with an out-of-nowhere goal that amped up UMass’s sideline in the face of a big home crowd for UNC. At that moment, if you squinted, it looked like maybe it could be Zoodisc’s day. But at 2-2, Elijah Long was able to pick off a wayward inside flick and immediately send up a lob for Colin Smith to dunk home for the break. In hindsight, that lone goal would have been enough to win, as UMass couldn’t generate real pressure on Carolina’s handlers and Darkside went the full game without giving up a single break. Like the rest of the team, Kai Marcus had been heating up over the course of the weekend. Picking out shoulders on his receivers the way most chuckers pick thirds of the field, he was throwing out questions that UMass’s defense couldn’t answer. Carolina’s offense didn’t see much of the field in the first half because the D-line was busy, going on a three break run to close out the half 8-4. The telltale signs of a deflated team at the end of a long weekend were all there for UMass—they gave up easy scores on a dropped pull and a bobbled swing pass. In the second half, the result was a forgone conclusion. Both sides seemed willing to trade hucks with neither defense reacting to provide extra cover over the top. On game point, UNC’s D-line put the final away. Collin Smith notched his third block of the game and Elijah Long took over from there. The senior put together as impressive a 70 yards of dink-and-dunk dominator as you’ll see all season before catching the winning goal over the body of his defender who he had spun into to the ground. After missing most of their roster at Carolina Kickoff, UNC was at full strength this weekend and it showed. They got contributions from all players, from new member of the O-line sophomore John McDonnell all the way to fifth-year Walker Matthews, who was quietly excellent for the D-line. “Walk is playing the best ultimate of his career at this tournament,” said Darkside coach JD Hastings. The fact that Walker, a U24 player playing the best tournament of his career, gets his first mention in the penultimate paragraph of this section should say enough about how comprehensive Darkside’s play was at Queen City. UNC may slip up somewhere down the line, but the signs from this weekend should leave Old Man Eisenhood feeling good. The teams traded breaks back and forth in the first half, with UMass’s young D-line players making an impact. Gabe Franklin reeled in a huck to put Zoodisc up a break 5-4, and Tannor Johnson was able to find the endzone on the next three O-line points to send the game to half at 8-7. NC State struck back out of half with a break that prevented UMass from expanding its lead. The NC State D-line kept the team hanging around all game, able to claw back a few points whenever it looked like UMass was starting to cruise. Veteran Michael Lee and sophomore Trevor Lynch did most of the heavy lifting after the turn and crossed over to the O-line in tough spots. The second half turned into a battle of NC State’s polish against Massachusetts’s physical edge. NC State’s spacing and technique in setting up cuts created open deep looks even late in the game, while UMass was often able to go over, past, or through State’s lines when they needed to. The latter came into sharp focus at 16-16, when UMass sent their two best athletes flying downfield and dared State to match them. Tannor Johnson chased down a disc on the goal line and Chris Bartoli came soon after to receive a dish for the goal that sent UMass to the final. While they would run into the brick wall of Carolina, QCTU proved that UMass has the physical tools to succeed this year. They have the remainder of the season to develop the rest. In what has become a familiar refrain, NC State will rue their missed chances. At both 13-13 and 14-14, their D-line had good looks at a break that could have tilted the tie in their favor. So while some will say “same old State,” this is clearly the best NC State team in recent memory. With the steady hands of Conor Chickos and Michael Lee pacing both sides of the disc and youngsters Dylan Hawkins and Trevor Lynch already making an impact, at this point Alpha should be considered the second best team in the Atlantic Coast behind Darkside. The third Carolina team to make semis, UNC Wilmington, may have silenced some doubters this weekend. The Seaman won Pool D with a late game run against a underwhelming #22 Auburn, snuffing out Aetos’s pull plays and ripping off four swift breaks to win 12-9. Matt Ellis is picking up where he left off his freshman year and Connor Russell is showing he can handle the weight of being the offense’s focal point. Two of their best players, Willie Stewart and U24 selection Rick Hennighausen, largely played defensive points, a luxury most teams don’t have. The freshmen looked good, especially Owen Maskelony, who squeezed an inch-perfect upline touch throw into space for a huge goal during crunch time in Wilmington’s game against Maryland in quarters. While this weekend showed that the pieces are there, it’s still unclear what kind of puzzle Wilmington are assembling. The offense doesn’t seem to have an identity yet, not quite sure whether they should be trying to run and gun like Wilmington teams of old or play a more methodical style. The O-line couldn’t put Maryland away in their tight quarterfinal, leaving the D-line to collect two huge breaks in the last act of the game. You can make a similar case for Ohio State, who missed toppling UNC Darkside by a single point. The game had a certain “playing with their food” quality on North Carolina’s end, but with the game on the line, Leadbelly was able to break the vaunted UNC offense to force double game point. Chase Gregory was letting it fly all weekend from the handler position and a regular target downfield was the hulking Andrew Kramer. Ohio State received a boost when Kramer came to the school with his fifth year of eligibility as a grad student from Dayton. He had a nose for the endzone, scoring several key goals under pressure. Ohio State showed fight, keeping pace with UNC and fighting back from a deficit to push NC State in quarters, eventually falling 15-13 from an 11-6 deficit. If Leadbelly is going to take the next step towards Nationals contention, they will need to clean it up on offense, but they did themselves a favor in the algorithm department by playing close with UNC and coming back to avoid a big drop against State. Ohio University came up with one of the biggest surprises of the young season by making the quarters at QCTU as the lowly twentieth seed (for reference, Maryland, Nationals qualifier in 2015 and 2018, had not made the championship bracket this decade until this weekend.) There are plenty of obstacles for last-seeded teams at tournaments, coming from both the format and mindset, but it didn’t stop Ohio. Employing high level concepts and impressive throwing skill, they beat Virginia and Chicago in the morning, then came back to take down fifth-seeded Auburn on double game point. This win put them in the bracket, and they hung around early with Wilmington before fading down the stretch. That fatigue makes sense when you look at their roster composition. The team simply lacks depth. The talent at the top, though, is intriguing with do-it-all Michael Kromer dictating most of the action, while Jason Wherry finds weak points in the defense with his throws. Getting clobbered by UMass provides some perspective on the team’s ceiling, but at the very least don’t be surprised if they ruin someone’s season at Regionals. The other surprise quarterfinalists Alabama were not playing as dynamically as Ohio, but you can’t argue with the results. The team made their bread on Saturday with aggressive hammers, but UNC swallowed the majority of those looks in the bracket. Bama’s win over a hobbled Maryland bears something of an asterisk—coming off a DGP loss, Maryland decleated a few banged up players including John Walden—but it’s one of the best weekends this program has had in a long time. The fun stories of Ohio and Alabama come at the expense of the respectively fifth and sixth seeded Auburn and Carnegie Mellon. Auburn got bull-rushed by Wilmington in pool play—their offense couldn’t credibly get the disc past their own brick mark at the end of the game—and then faltered against Ohio. Depth seems like it could be a problem for Aetos this year, and a program that has overcome a lot of adversity has another hill to climb this season. Carnegie Mellon simply doesn’t have the juice beyond Jasper Tom (who, for the record, definitely has the juice) to move the needle. They were fortunate to get past Notre Dame on double game point and got played off the field by NC State before collapsing against Alabama. As good as Tom is, it doesn’t appear to be enough. If John Stubbs couldn’t get that 2017 Harvard team to Nationals, it’s hard to see Tom doing so for CMU here. Comments on "Queen City Tune Up 2019: Tournament Recap (Men’s)"